Do you have Achilles Tendonitis? 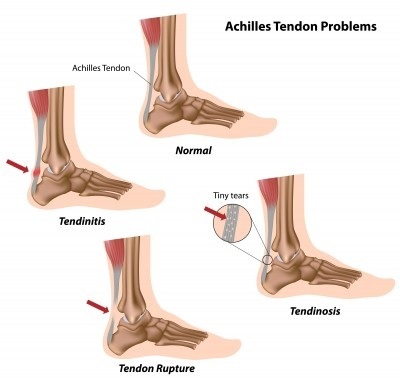 Achilles tendonitis or tendinopathy is a common overuse injury in runners. Sufferers often experience a dull or sharp pain along the Achilles tendon--usually close to the heel on the back of the ankle. This large tendon connects the two major calf muscles to the back of the heel bone and it gives us the power to push off. The term "tendonitis" is misleading as inflammation of the tendon is not the root cause of the problem. There is actual degeneration or damage to the fibers or collagen of the tendon, which can be very painful and often require more than rest to heal. The condition is now often referred to as Achilles tendinopathy. For simplicity I will refer to the condition as tendonitis in this article. Symptoms include experiencing ankle pain at the onset of exercise, but eases as you progress and the tendon relaxes. Pain may also be felt when pushing off or when jumping. Pain or stiffness in the morning or after sitting for long periods is common. Ankle flexibility will be reduced and there may be redness or heat over the painful area. The pain usually improves with rest. There may be a small lump or build up of scar tissue on the tendon. You may also hear a crackling sound caused by scar tissue rubbing against the tendon. Healing often takes a long time because there is limited blood supply to this area. This condition can become chronic, so it is best to take care of it early. Too much stress on the Achilles tendon causes it to become tight and fatigued and that is when it can become easily injured. It often forms scar tissue, which is less flexible than the tendon. Because it is stiffer, it is more susceptible to injury especially when running. If you continue to put stress on the achilles tendon, the collagen fibers can tear or rupture. Our tendons become less flexible as we age so Achilles injuries are more common in older runners. Excessive speed training can also be a factor as increased speed will place increased stress on the Achilles. Runners who are new to barefoot running or those who try to transition to barefoot running too quickly often experience Achilles tendonitis. The lower heel in minimal shoes can add extra stress to the tendon that the runner is not used to. Overpronation is another main cause for achilles tendonitis. If the foot is excessively pronating, the Achilles has to work harder to compensate and stabilize the body. The Late Gordon Pirie, Olympic medalist and author of Running Fast and Injury Free, suggests that the design of today's running shoes can cause Achilles tendonitis. Many running shoe styles have a build up area on the back of the heel. It is meant to protect the ankle as it covers the back of the ankle in the area of the Achilles tendon. He believes that during running this part of the shoe puts pressure on the tendon and causes it to become injured. In his opinion, the top of the shoe should not be higher than the heel. He actually suggests cutting off this part of the shoe to reduce the risk of Achilles injuries. To gain access to his book and to receive a free copy of my new book, "Running Injury Free: 5 Unconventional Ways to Enjoy Pain Free Running," sign up for free updates from The Peaceful Runner Newsletter. The Achilles tendon is the largest and strongest tendon in the body and it is also the most vulnerable to injury because of its limited blood supply. There is one particular area around the ankle that is most susceptible to injury as it has the poorest blood supply. This is often where the ankle pain is felt. It is important to stop running and rest, but rest alone will not heal chronic Achilles tendonitis. You will need to take active measures to help your tendon repair itself. Try self-massaging the area. Use small, circular motions in all directions away from the lump or scar tissue. Ice the area to reduce swelling and keep your foot elevated whenever possible. Anti-inflammatory drugs may be helpful. Ensure you are wearing the correct running shoes and avoid weight bearing activities. You may need to seek physical therapy or massage therapy to speed recovery. Taping the leg to support the tendon and wearing heel lifts to reduce the strain on the tendon are both common treatments. It is important to treat and correct the problem early before it becomes a chronic condition. Surgery may be required in extreme cases if a rupture or a tear exists. An MRI can be used to determine if there is a tear. Eccentric exercises can be very beneficial in aiding recovery of Achilles tendonitis. Eccentric Training includes exercises in which muscles are lengthening and firing at the same time. A study by Dr Håkan Alfredson in 1998 split 30 recreational runners into two groups. One group performed eccentric exercises and the other group did not. The group who used eccentric exercises returned to running within 12 weeks. The other group failed to improve and some of them required surgery. Dr Håkan Alfredson recommends 3 sets of 15 reps twice a day every day. "Daily eccentric training for Achilles tendinopathy is a safe and easy measure, with beneficial effects on the microcirculatory tendon levels without any evident adverse effects in both mid‐portion and insertional Achilles tendinopathy." Eccentric exercises should only be performed if there is no swelling in the area as you will probably experience some pain as the tendon is lengthened. These exercises are designed so that you do the work on the way down and not when rising up. See the video below that shows how to perform an eccentric exercise for Achilles tendonitis. End Your Running Pain Now! !